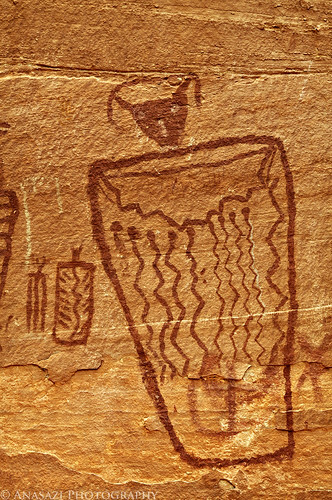 Let’s go back to a pictograph I took a photo of last weekend in the Needles District of Canyonlands National Park. This figure is probably one of the most unique out of all of the figures at the Flying Carpet Panel. The interior designs on the torso are very interesting, and while this particular anthropomorph is probably not a cat, the head on this sure reminds me of one. It looks like there might even be a snake over it’s head, or maybe that’s just an arc?